High pressure continues to dominate September weather in the UK. In Reigate it hasn’t rained for 8 days and temperatures during these sunny days with broken cloud have regularly reached the low 20’s and even Tmax 23c on Tuesday. The HIGH is edging to the NE and this will encourage light easterly winds over the SE which often brings more cloud off the North Sea and a risk of more dreary anticyclonic gloom at times perhaps building up by this weekend. Cloud at night will maintain temps easily into double figures for Reigate but depress them somewhat into high teens in the day. Nevertheless, it will remain dry into the weekend and any sunny spells will feel delightfully warm for late summer. 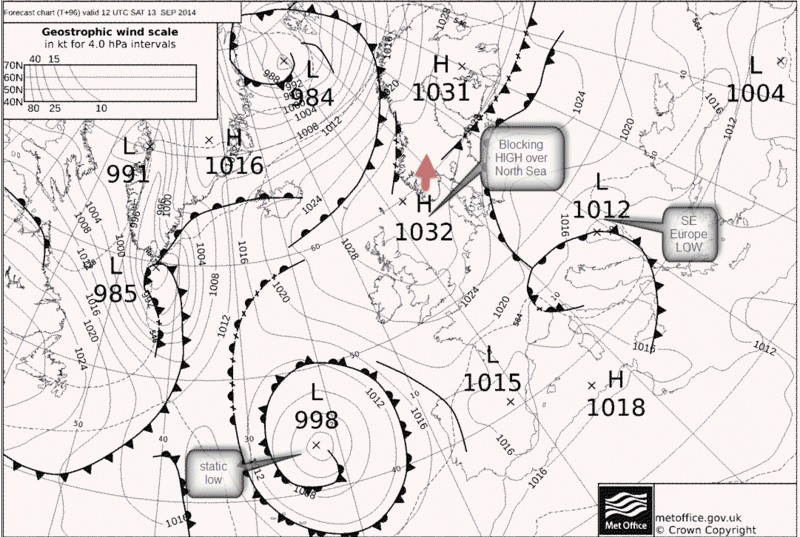 The blocking anticyclone is called an omega block which is named as it looks like the Greek letter. Traditionally these are persistent blocks which can last for a long time maintaining dry settled conditions, as it is now. The jetstream remains far to the north taking stormy weather over Greenland and Iceland (where the Holuhraun fissure eruption is taking place and the larger Bardarbunga volcano threatens to blow as the caldera sinks by a remarkable 20 metres). Winds over Iceland are generally blowing away from Europe at the moment and taking the SO2 eruption cloud over East Iceland and Norway. Last weekend there was a brief spike of SO2 over England and Wales which was brought down by a cold front that carried some sulphur dioxide from Iceland over Ireland and into Scotland, Wales and England. The spike short lived and unlikely to cause any health impacts. The models (GFS and ECM) have been predicting the end of this HIGH pressure for a while but it has persisted and bucked the computer models. 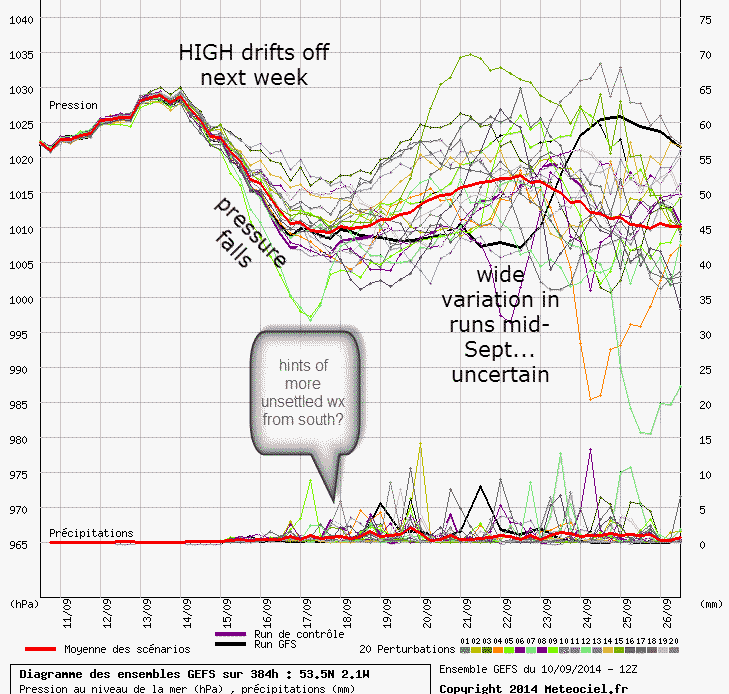 Currently, models see the HP (high pressure) drifting slowly further to the NE next week and pressure will fall first across southern UK creating conditions for showers to drift up on a slack Southerly flow: some models bring the first light showers as early as Sunday and Monday, however this is probably too early. Another factor that is worth watching is a developing tropical disturbance off Cape Verde in the Atlantic which model runs are predicting will arrive in the Mid-Atlantic in the middle or end of next week. The track is not certain yet, of course, but it could have an impact on how this high pressure eventually either falls apart or even builds back in again after a possible unsettled spell from mid-week next week.